I was going through some old boxes a few days ago when I stumbled across a bunch of pictures I had taken back in 1991 of an anti-Biya rally organized by university of Yaounde students in Limbe following the May 6, 1991 events at the university. The placards that the students carried were replete with "Biya Must Go" type messages at a time when the President was on the ropes, and being pommeled by a buoyant pro-democracy movement. 21 years later, however, President Biya is still in power and very much in control of the Cameroonian political landscape. In fact, his only real challenger seems to be the ticking clock of nature. And the young student activists of 1991, who were noted for their running battles with security forces, are now middle-aged adults, many of whom now occupy prominent positions within the once-despised Biya regime and/or actively militate within the ruling CPDM party. Today, the “Biya Must Go” mantra has been taken over by a new generation of student activists, most of whom were mere toddlers or were not yet born in 1991, and who have never known any president other than Biya. Is it possible that Biya may also outlive their militantism!? Why did Cameroon’s democratization process fail in spite of the vast mobilization of human and material resources on behalf of the pro-democracy movement? How did the Biya regime succeed, against all odds, to hang onto power and then seize the political initiative from the opposition which apparently had everything going for it in the early 1990s? How did Cameroon’s democratization dream morph into what has variously been described as la démocratie emballée / a democracy that lost its footing (Ngniman, 1993), une transition manquée / a failed transition (Sipa, 1992), la démocratie… piégée / booby-trapped democracy (Jeune Afrique Economie no. 140, février 1991, p. 119), une transition démocratique ratée / a missed democratic transition (Gruénais, M.-E. (2002), l'interminable transition / the never-ending transition (Moluh, 2006), and une transition qui n'a pas eu lieu / a transition that did not take place (Jean pascal daloz, 1997)? How did Cameroon’s quest for a viable democratic system end up with a political nightmare that was once pompously referred to "la democratie avancée"? In short, what explains Biya’s longevity? In the numerous tweets that Cameroonians posted on Twitter on this day, some argued that Biya's staying power could be explained by "Intellectual dishonesty, self interest, shortsightedness and a neocolonial benefactor bent on preserving the status quo," while others pointed the finger at "the role of the military, an inefectual civil society, the instrumentalization of ethnicity, an emasculated opposition..."
So what's your take? 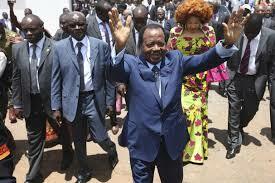 What do you think is the secret of Biya staying power?